Sunset Crater Volcano National Monument is the slightly tautological name given to an area northeast of Flagstaff containing the results of much igneous activity - several colorful cinder cones formed by extinct volcanoes, and large expanses of lava and ash, mostly unobscured by vegetation and still pure black in color. The dominant peak is Sunset Crater; as with the other cones its slopes have distinctive dusky red-brown patches formed by oxidised iron and sulphur, which caused John Wesley Powell, who was the first modern-day explorer of the area in 1887, to name the mountain 'Sunset Peak'. The contrasting colors of the cinders provide the most unusual aspect of the national monument but the jagged and twisted lava fields are also quite spectacular. Sunset and the neighboring craters are just one small part of the San Francisco volcanic field, an extensive region of nearly 2,000 square miles that contains some 600 identified volcanoes. Twenty miles from the national monument, Flagstaff has a good selection of hotels - follow the link for descriptions, photographs, map and reservations. The monument is reached by a side road off US 89, 16 miles north of Flagstaff, a road that later passes through Wupatki National Monument before rejoining the highway 15 miles further north. Payment (2019) is $25 per vehicle, made at the visitor center near the entrance - the fee gives access to both monuments. The center has a small museum with interesting exhibits about volcanism, and a seismograph which continually monitors earthquake activity around the world. 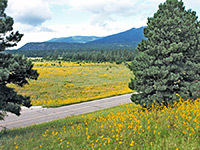 The road to this point passes through pine woodland with flower-filled meadows and views of distant volcanic hills, and the surroundings are similar for the US Forest Service campground located opposite the visitor center. Camping is not permitted inside the monument, though this is possible free of charge in many places in the surrounding Coconino National Forest land. Soon after the visitor center the road passes a huge expanse of lava, the Bonito Lava Flow, which is one of three large volcanic deposits in this part of the San Francisco field (the other two are the Kana-a and Strawberry Crater flows, a few miles northeast). 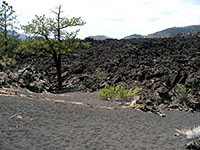 There is no trail through the main area of lava, north of the road, and while off-trail hiking is allowed it is generally difficult to make progress over the jagged black landscape due to the extremely sharp, uneven and brittle rocks (see 360 degree panorama). Most of the lava is the aa type but the smoother pahoenoe variety is also seen, and the flow contains other characteristic features such as ravines formed by collapsed lava tubes (where molten magma continued to flow beneath a solidified crust), and squeeze-ups - thin, sharply edged ridges of lava that pushed up from underneath cooler overlying deposits. 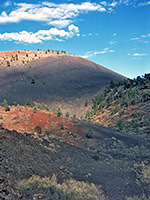 Sunset Crater itself is a mile east of the Bonito Lava Flow, and although climbing to the top would seem to be an obvious aim, this is no longer permitted since the trail to the 1,000 foot summit was closed in 1973 to prevent excessive erosion. Instead there is a very good loop path (the 1 mile Lava Flow Trail) around the formations at the foot of the volcano, passing features such as an ice cave (a former lava tube) - a cavern that contains permanent ice all year and so has refreshingly cool air emerging, but the trips that used to be offered into the cave are currently suspended. 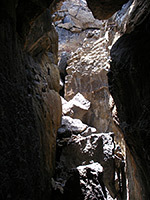 There are also several spatter cones (subsidiary lava vents), lava ravines and examples of the less common pahoenoe lava. 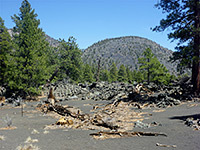 The vegetation around the volcano is sparse, consisting mainly of scattered ponderosa pine trees, many of which are dead due to an unstable root base and lack of water; the area is generally quite desolate and looks as if the eruption occurred very recently although it actually happened in 1065, with some lesser activity over the following 200 years. 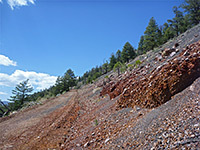 Other nearby peaks have the same distinctive rusty color, and some can be climbed though only one has a recognized trail; this is Lenox Crater, immediately west of Sunset Crater, where a steep half mile path winds through pine trees climbing 280 feet to the rim of the crater on top, from which numerous other cinder cones can be seen in all directions, especially towards the south. A much longer path (the 5.4 mile O'Leary Peak Trail) climbs nearly 2,000 feet to the summit of one of the larger dome volcanoes just north of the national monuent. To the east, the national monument has one further viewpoint, Cinder Hills Overlook, looking towards many more volcanic summits in the southeast, including Double Crater, Haywire Crater and Stewart Crater - see panoramic photograph. The elevation of the land hereabouts is high, the tallest peak being 8,916 feet, but after about 10 miles further east the main road descends 2,000 feet towards Wupatki National Monument at the edge of the Painted Desert, the relatively flat and barren land that occupies a vast area in northeast Arizona. Just before the drop, another overlook gives a good view of the desert, and of the largest lava flow in the area, around Strawberry Crater to the north. The crater is accessed by an unpaved track but high clearance vehicles are required. Shortly west of Painted Desert Vista, a few other side roads (to the south) lead to ideal free camping sites, set right amidst the black ash landscape and close to several cinder cones.